I leave my cream cheese, butter and eggs out to reach room temp. In Mixer, cream butter, cream cheese and sugar until smooth, add eggs one or two at a time, then add flour one cup at a time. Last, add 2 to 3 tsp of vanilla flavoring. Sprinkle pecans and brown sugar on top, lightly press into the batter. increase heat to 325 and bake another 30 minutes. You can test for doneness with a wooden skewer. If you insert and cake is not done (still wet), allow to bake a little longer until skewer can be inserted and comes out dry. Remove from oven and allow to cool a few minutes before removing from pan. 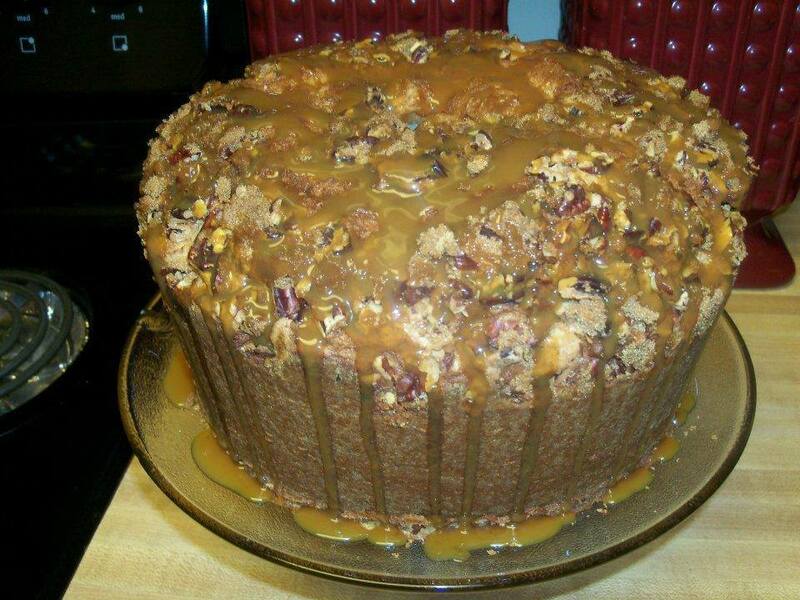 When you invert onto a plate, you may lose a few nuts, Then, drizzle with a jar of caramel to your liking. As you can see there are some ingredients missing that are in most cakes such as milk, baking powder, baking soda, salt etc... Feel free to tweak your cake to your liking, but this is what I found works best.